I’m just a tiny bit obsessed with Downton Abbey. (Really, aren’t we all?) 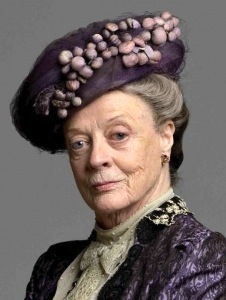 And, as you’ve probably guessed, I absolutely love me some cranky-pants Dowager Countess—she’s just so delightfully acerbic! Are you crushing on Dame Maggie too? 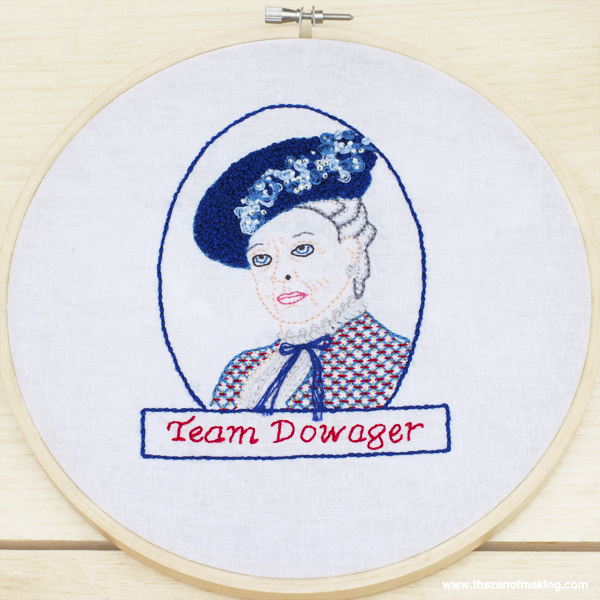 Stitch up a tribute in fabric and floss with my Downton Abbey-inspired Dowager Countess embroidery pattern! 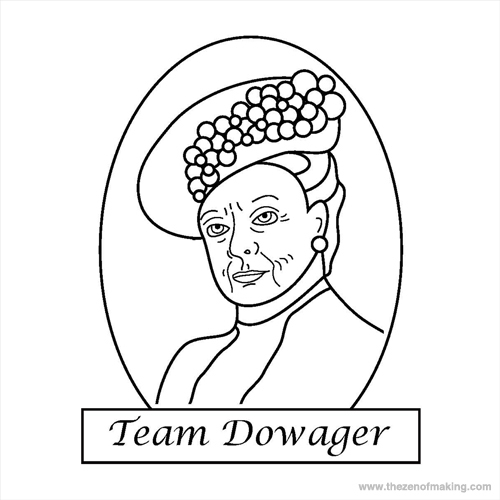 I provided the outlines, but you can customize the colors, clothes, and, especially, the HAT to suit your own ideal Dowager style!  Don’t print this image! Download the full PDF here. 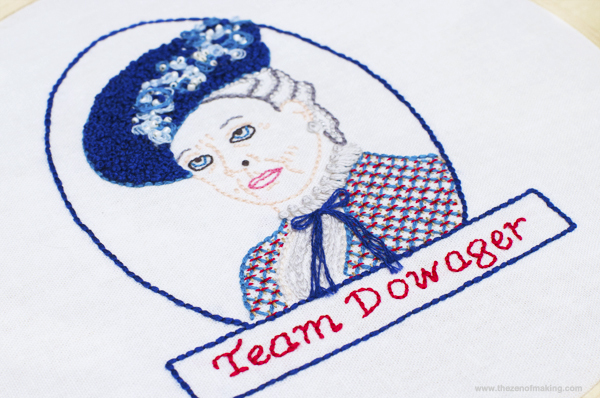 I embroidered my Dowager Countess using straight stitches for the outlines and a wide variety of textured stitches for the details, including french knots and bead embellishments for the hat, diagonal laid work for the jacket, and chain and split stitches for the shirt and collar. I also added some silver embroidery floss to the hair to add some shimmer. These are only suggestions—you can get as creative as you want with your own stitching! I think the face and jacket look kind of like a watercolor painting from this side. I like it. Detail view of the hat stitches: french knots and beading. Detail view of the jacket stitches: diagonal laid work. 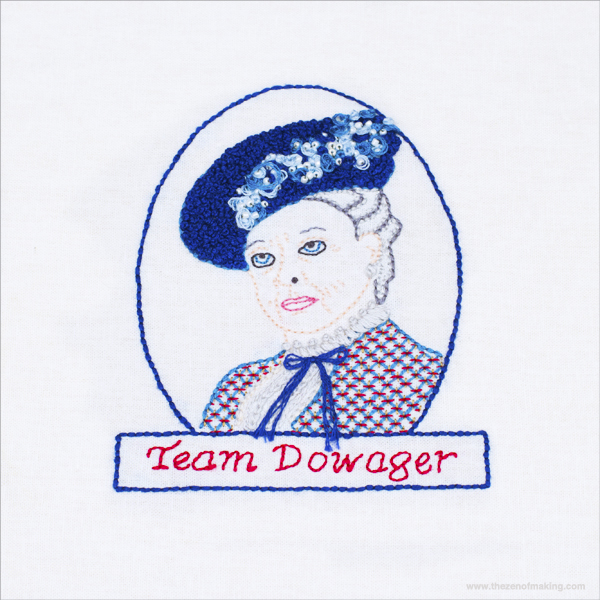 Print out the Team Dowager Embroidery Pattern PDF, and then trace it onto your fabric with a water soluble fabric marker. I’m so excited for episode 5! How many of you are going to be stitching while you watch this Sunday? 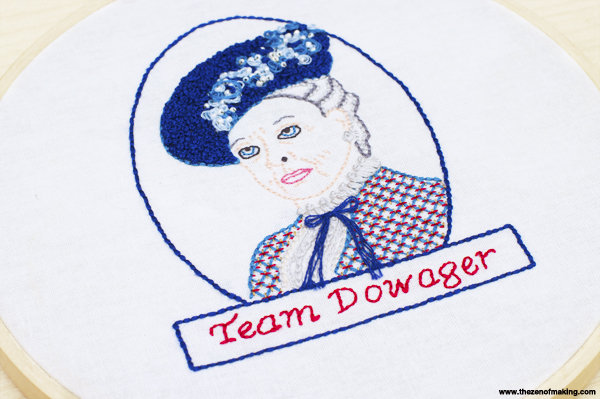 If you embroider your own Dowager Countess—especially if you get creative with the hat—I definitely want to see photos! In love with the hat. 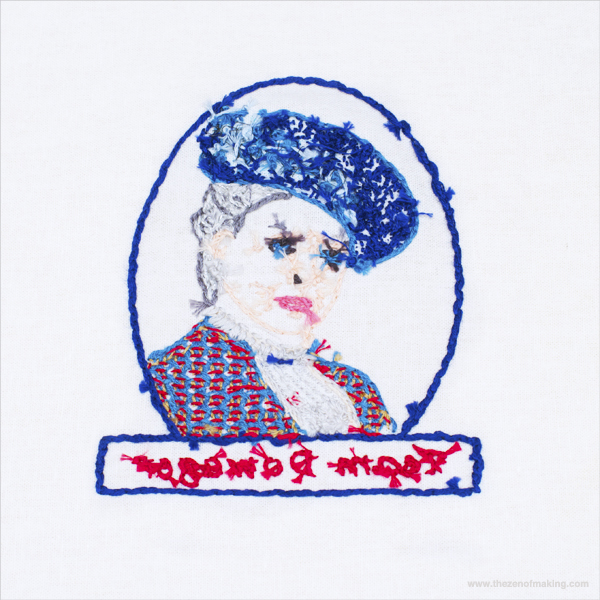 Can I embellish my own hat with French knots? Would that be weird? Probably. Gah. 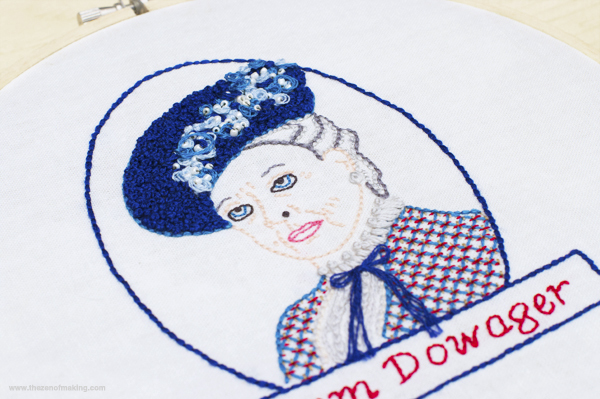 Embellishing a real hat with french knots would take FOREVER. Mind you, it would also look really awesome. OMG love! Great job! Love that quote, by the way. This is brilliant! Thank you. I am going to make a throw pillow for gift with this pattern.